Image Illustration by Jeff Carson and story by Albert Koehl from the news section of our NEW EQUITY issue -- arriving tomorrow! July 3! 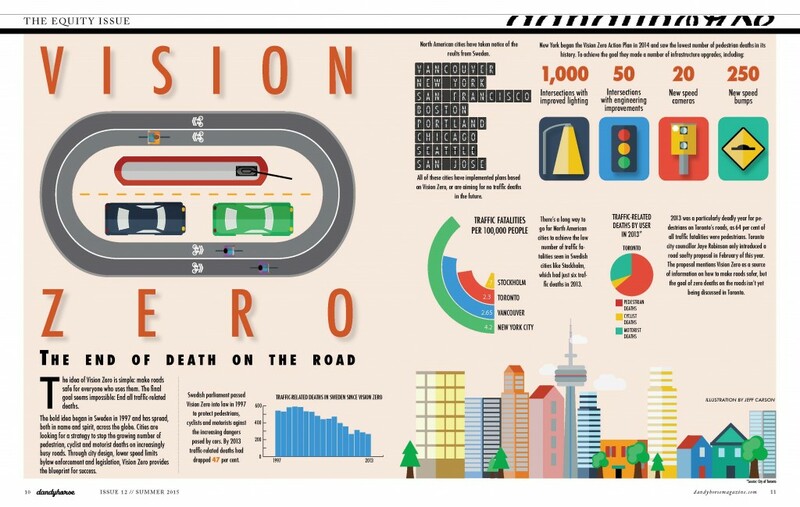 Is Vision Zero, the Swedish initiative to eliminate road deaths, coming to Toronto? A Swedish video on the issue lays the premise of the movement: “For some reason, we seem to be more tolerant of death if it happens on the roads.” In coming up with Vision Zero, Sweden rejected the notion that deaths are the price of mobility. Toronto has a long way to go in the prevention of transportation-related fatalities. In 2013, 51 people, including 44 pedestrians and cyclists, died on Toronto roads. The lack of serious attention from Toronto City Council and the province suggests that such deaths remain acceptable on our streets. The plan includes comprehensive measures to reduce road deaths and would potentially reduce speed limits Few politicians would, in principle, oppose a plan to reduce road fatalities. But the more important question is how many would support specific measures, such as lowering speed limits? Both Ontario’s Chief Coroner and Toronto’s Medical Officer of Health have made the case for lower speed limits, specifically 30km/h in residential areas. In the wake of the death of a 7-year-old girl in Leaside last year, a community group has organized a similar demand. Councillor Robinson has not specifically committed to lower speed limits, nor does she appear in favour of lower speeds on arterial roads where many deaths occur, many of which are also residential in character. In the meantime, the province is studying a plan for lower default speed limits, while a special evening meeting to discuss lower speed limits in residential zones is scheduled for June 22, 2015 at the Toronto and East York Community Council. For now, “A Road Safety Plan for Toronto” has been deferred for further study. 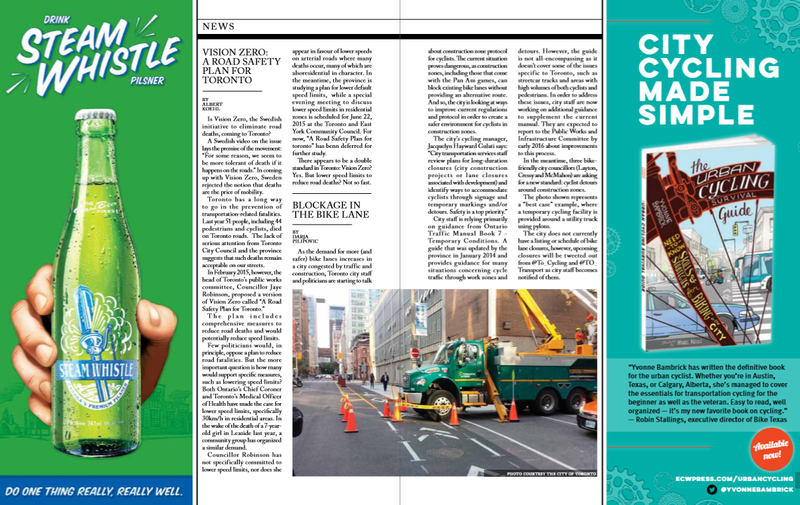 There appears to be a double standard in Toronto: Vision Zero? Yes. But lower speed limits to reduce road deaths? Not so fast. The new issue of dandyhorse is coming tomorrow! Pick up a free copy on July 3 at Urbane, Sweet Pete's, Bikes on Wheels and Hoopdriver. You can buy it online here and at these independent book shops.